Remembering the anniversary of the death of a loved one. 1. Reminisce and tell favorite stories or memories about the person who has died. This is often fun in a big group over a meal. It’s especially great if there are people in attendance that knew the person throughout different periods in the deceased one’s life. 2. Take flowers to the grave site, memorial site or location of the tragedy. This could be done individually or in a group. 3. Make a donation to a charitable organization or start a scholarship in the deceased person’s name. It is especially personal if the deceased person had an organization they were particularly active in or strongly supported. 4. Make a collection to display the deceased personal items, serve their favorite foods, display different photographs or funeral programs, or watch a video. Obtain a keepsake memory box and include items that have special meaning to you and the deceased. Construct a memory book and include such items as the deceased’s funeral program, obituary, special poems, quotes or songs, and photo collages. You can have the deceased person’s favorite music playing in the background. 5. Make a toast or say a prayer at the start of a family meal or gathering. 6. Plant a tree or dedicate a bench or plaque. 7. Create a new tradition or plan a weekend getaway. 8. Write letters or a journal to the loved one to express your feelings or publish a memorial in the newspaper. Be aware that anniversaries may trigger heavy feelings of grief. Do not be afraid of them, rather embrace them and reach out to your other family members and friends. Don’t try to hurry the grieving process, rather feel your way through it and remember the very special person in your life. A death anniversary is a custom observed in several Asian cultures including China, Pakistan, Israel, Georgia, India, Iran, Japan, Korea, Russia and Vietnam, as well as in other nations with significant overseas Chinese, Japanese, Korean, Jewish, and Vietnamese populations. Like a birthday, it is celebrated each year, but instead of on the date of birth of the individual being celebrated, it is celebrated on the day on which a family member or other significant individual died. There are also similar memorial services that are held at different intervals, such as every week. Although primarily a manifestation of ancestor worship, the tradition has also been associated with Confucianism and Buddhism (in East Asian cultural civilizations) or Hinduism (South Asia but mainly in India). Death anniversaries are also commemorated in Judaism (the majority religion of Israel) where it is called by various names. In China, a death anniversary is called jìchén (忌辰) or jìrì (忌日). This type of ceremony dates back thousands of years in China (at least to the Shang Dynasty) and historically involved making sacrifices to the spirits of one’s ancestors. In Nepal and India , a death anniversary is known as shraadh. The first death anniversary is called a barsy, coming in Nepalese and Indian, baras meaning year. Shraadh means to give with devotion or to offer one’s respect. Shraadh is a ritual for expressing one’s respectful feelings for the ancestors. According to Nepali and Indian texts, a soul has to wander about in the various worlds after death and has to suffer a lot due to past karmas. Shraadh is a means of alleviating this suffering. Shraddhyaa Kriyate Yaa Saa: Shraadh is the ritual accomplished to satiate one’s ancestors. Shraadh is a private ceremony performed by the family members of the departed soul. Though not mandated spiritually, it is typically performed by the eldest son and other siblings join in offering prayers together. Often there are one-year prayer meetings. These occur one month before the one-year date. In Japan, a death anniversary is called meinichi (kanji: 命日), kishin (kanji: 忌辰), or kijitsu or kinichi (kanji: 忌日). Monthly observances of a death are known as tsuki meinichi (kanji: 月命日), while annual anniversaries are known as shōtsuki meinichi (kanji: 祥月命日). In Korea, ancestor worship ceremonies are referred to by the generic term jerye (hangul: 제례; hanja: 祭禮). Notable examples of jerye include Munmyo jerye and Jongmyo jerye, which are performed periodically each year for venerated Confucian scholars and kings of ancient times, respectively. The ceremony held on the anniversary of a family member’s death is called gije (hangul: 기제; hanja: 忌祭), and is celebrated by families as a private ceremony. For such occasions, the women of the family traditionally prepare an elaborate set of dishes, including tteok, jeon, jeok, and so forth. 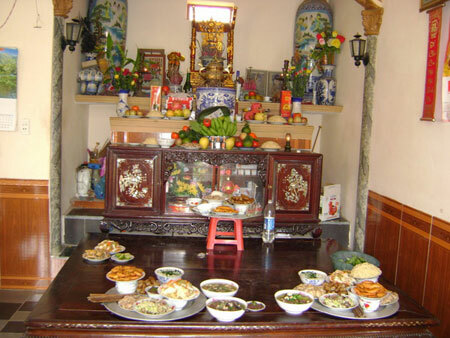 In Vietnam, a death anniversary is called giỗ, ngày giỗ (literally “giỗ day”), đám giỗ (literally “giỗ ceremony”), or bữa giỗ (literally “giỗ meal”). It is a festive occasion, at which members of an extended family gather together. Female family members traditionally spend the entire day cooking an elaborate banquet in honor of the deceased individual, which will then be enjoyed by all the family members. In addition, sticks of incense are burned in honor and commemoration of the deceased person. It is not unusual for a family to celebrate several giỗ per year, so the ceremony serves as a time for families to reunite, much like the Vietnamese new year, Tết. The rituals are the responsibility of whoever inherits the ancestral estates, typically the deceased’s most senior patrilineal descendant. Although a giỗ is usually a private ceremony attended only by family members (and occasionally also close friends), some are commemorated by large segments of the population. The commemoration of the Hung Kings (Giỗ tổ Hùng Vương), the legendary founders of the first Vietnamese kingdom in Vietnam’s remote past, and of the Trung Sisters are widely participated. In March 2007 Giỗ tổ Hùng Vương became a public holiday in Vietnam. As in all traditional commemorations, the Chinese calendar is used. In Vietnamese culture, certain special, traditional dishes (particularly desserts) are only prepared for death anniversary banquets. In addition, favorite foods of the deceased person being honored are also prepared. Chicken, a particularly prized meat in Vietnam, is often cooked as well. In Central Vietnam, small stuffed glutinous rice flour balls wrapped in leaves called bánh ít are such a dish. Because the preparation of so many complex dishes is complex and time-consuming, some families purchase or hire caterers to prepare certain dishes. It is also common that a soft-boiled egg be prepared and then given to the oldest grandson. Next Anything But A Comedy of Errors – The Ordeal of Joan River’s Death!